Preheat oven to 180C. Place the vegetables on 2 baking trays lined with baking paper, in an even layer. Drizzle with olive oil and toss until the vegetables are coated. Roast in the oven for 30-40 minutes, tossing the vegetables occasionally and until tender. While vegetables are roasting make the rice and quinoa. In a medium saucepan combine rice and quinoa and water. Bring to boil, then reduce heat to low and cover with a lid and cook for 25 mins. Remove form the heat and let stand for 5 mins then remove lid and fluff with a fork. For the dressing, whisk together the tahini, garlic, lemon juice and water in a small jar. 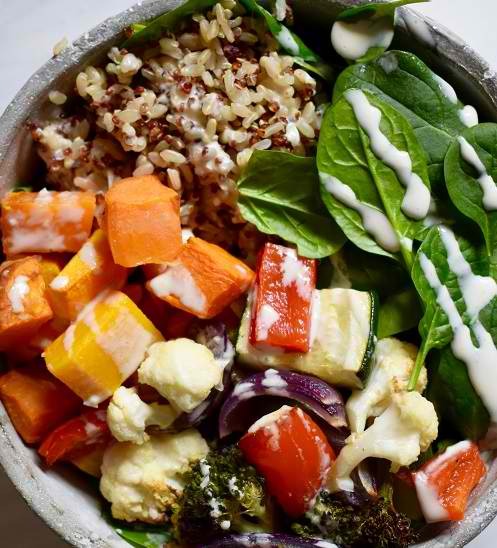 To assemble the bowls, add rice and quinoa, roasted vegetables and baby spinach. Drizzle with dressing.